Principal Cast : Casey Affleck, Rooney Mara, Will Oldham, Sonia Acevedo, Rob Zabrecky, Liz Franke, Grover Coulson, Kesha. 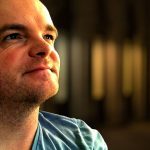 Visual poet David Lowery has begun to craft a solid body of work in his brief time as a director. 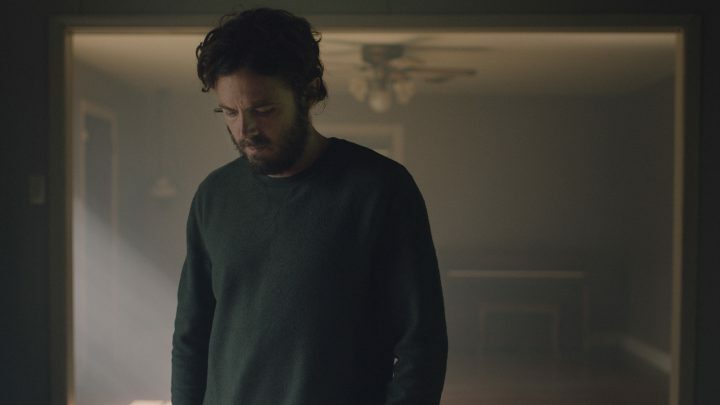 In only his third feature (following Ain’t Them Bodies Saints and Disney’s Pete’s Dragon), Lowery has painted a haunting (pun intended) tale of love, loss and melancholy, as only he can. 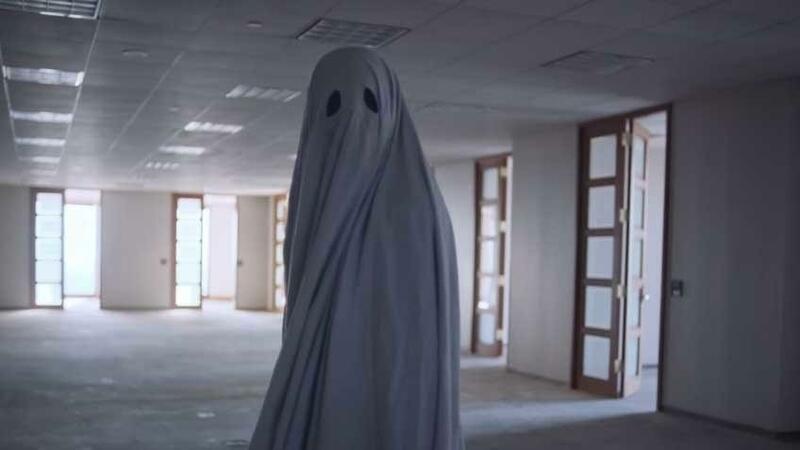 A film that by rights ought to have been laugh-out-loud hilarious (Affleck spends the majority of the film dressed in a white sheet, parading about his house) the conviction of Rooney Mara’s performance and Lowery’s Kubrickian direction, not to mention Andrew Palermo’s nostalgic cinematography, give A Ghost Story an undercurrent of heartbreak and unfathomable weight. 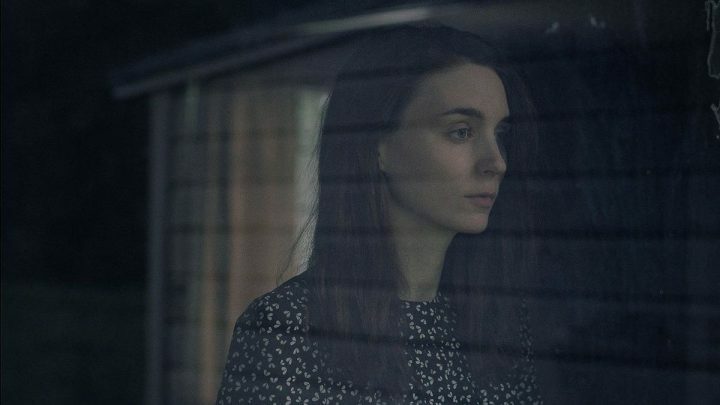 A subtle, moving examination of grief, A Ghost Story is recommended for those seeking a film that will appeal to few but reward those who embrace it. If you were to describe A Ghost Story to somebody who had never watched a film before, or was blind, they’d think you mad. Budding musician C (Affleck) lives with his wife M (Mara) and are soon to move house. 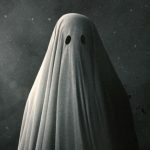 When he is killed in a car accident, C awakes in the hospital as a ghost, with a white sheet around him, and returns to his former home to watch over his grieving wife. As time passes, and M moves on (and moves out), C’s ghost remains, watching the next tenants move in (and move out) before the house is demolished to make way for an enormous office block (as the city grows around him). A ghost in the house next door (Kesha) can’t remember why she’s in the house next door; eventually, C’s ghost returns to the past, encountering a pioneer family who are setting up a home on the grounds of C’s future house, and time’s non-linear path begins to circle around to the present. A Ghost Story is a hard film to describe. It’s like a visual feeling, an ode to mood and emotion that transcends the medium in which Lowery works. Beautifully shot, directed with a command of the camera and frame that is truly remarkable, and eerie without being spooky, the film is just one of the most gorgeous things put to celluloid I’ve seen in 2017. 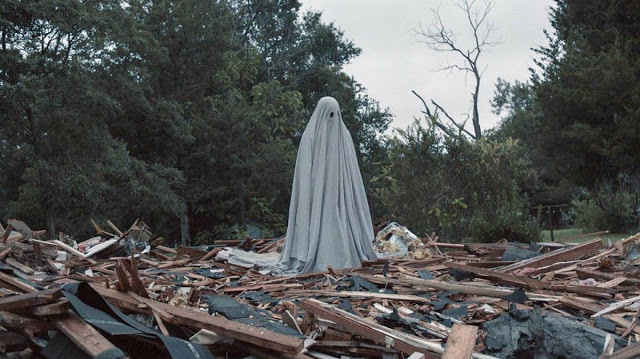 It’s rare I’ll fall so totally in love with a film so utterly bizarre, and I’d never recommend it to casual film viewers without a strong caveat to its uniqueness, but A Ghost Story has rocketed well into my top 10 of the year with a bullet. 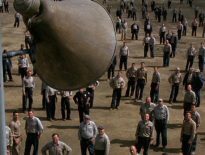 There’s little more to say about the film that says very little but delivers a lot: the screenplay is simply a series of vignettes and brief moments of time, captured in Lowery’s 1.33:1 aspect ration with a resolute yet lyrical, altogether bohemian colour palette. Affleck and Mara don’t so much inhabit their characters as they do simply inhabit the film as characters, representative of the Everyman and Everywoman in all of us. Affleck’s character’s demise occurs early on after a bit of set-up, leading to a tremendously satisfying pay-off at the film’s conclusion – Doctor Who fans would agree that A Ghost Story’s “timey-wimey” narrative is masterfully handled and eloquent without a word being spoken. Affleck, who personifies the ghost for much of the film beneath a terrifically moody costume in which his “ghost” is beset with holes in a sheet for eyes – sad eyes at that – doesn’t really have to do much more than stand and look around him, as the world (time) passes on following his untimely death. Mara’s work as M, particularly a scene in which she spends five minutes eating an enormous pie, hinges on her ability to convey emotion without hysteria (she does, and does well) and through this portal of pain the film opens up into something so much more. Lowery beautifully captures the raw pain in death, displays the pinky-blue opaqueness of hope, and the notion of cosmic inconsequence through the addition of a lovely monologue through musician Will Oldham, who traverses everything from Beethoven’s 9th to the existence of God and all in between. The film is largely set in the run-down weatherboard house C and M reside in, through early tenancy to its eventual destruction, while sidebar moments of beauty – the confinement of an office tower to the wide-open spaces of pioneer America – offer respite from the “caged animal” feeling permeating the movie. Lowery’s camerawork and minimal use of visual effects (there are some, and they’re superbly done and seemingly effortless) ground A Ghost Story in a believable, tangible reality that few films capture as sublimely. Simply put: this is a masterful directorial work, and without doubt is Lowery’s best yet. A Ghost Story is just superb. It’s a quiet, contemplative mood piece that won’t work for everyone, and there’s more than enough reasons for most people to skip it ten minutes in (some might think it’s a cheapo slasher flick and pick it up on a whim, and leave utterly disappointed) but for those who open themselves up to its charm, for those who enjoy films of intelligence and humanistic beauty (and pain), A Ghost Story is one of the most satisfying films of the year. Heartbreaking and joyous and terrifying and beautiful and sublime, I adored this movie and I cannot wait to revisit it again. So glad to see such a high score. I adore this film. I’ve seen it twice and sat through a conversation with Lowery. Talk about a fascinating process. I loved the film’s uniqueness. Unlike anything else I saw in 2017. Oh man I am so with you on that. I didn’t quite know what to expect from this one, and I’m glad I knew virtually nothing about it before watching it. I normally don’t go for these kind of “mood” pieces but A Ghost Story just clicked with me. I didn’t think Lowery’s style worked with Peter’s Dragon (IMO) but this film is astoundingly good. Rodney, the description is great. 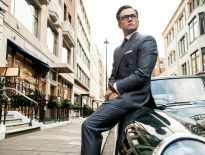 This film has interested me and I’m sure I won’t be disappointed.